The Federal Government has said former Vice President Atiku Abubakar has turned to deception to win the presidency after failing at the polls. Minister of Information, Alhaji Lai Mohammed, said in Abuja yesterday that two recent events linked to Atiku have shown that the former Vice President is turning to self-help. He said the appearance of posters in Abuja bearing the picture of former Vice President with the inscription: "THE PUKKA, H.E. ATIKU ABUBAKAR, THE REAL AND THE RIGHT" across major streets in Abuja is one. "Is he starting a fresh campaign after the elections have been won and lost? Has he rescinded his decision to challenge the results of the presidential election in court, perhaps after realizing that the results he claimed to have obtained from the INEC back server are cooked? Is he now going for self-help? 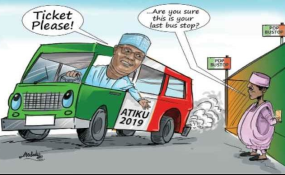 What really is Atiku's motive? He said even though the PDP presidential candidate had distanced himself from the posters and also reportedly denied hiring US Lobbyists but added that if the media reports are right, it means that the former Vice President "has suddenly realized the grave implication of his actions, hence has decided to beat a quick retreat before it is too late." "Resorting to self-help, as he seems to be doing now, is an act of desperation and the consequences are dire," he said. Alhaji Mohammad said the PDP presidential candidate, "out of desperation, is thinking of replicating the Venezuelan model right here in Nigeria. But he should realize that Nigeria is not Venezuela, and that the situations in both countries are not the same." He said the outcome was not a surprise "considering the pro-poor policy of the Administration" which he listed to include feeding 9.3 million school children everyday; empowering 500,000 graduates under N-Power; 300,000 families are benefiting from the Conditional Cash Transfer; Interest-free loans of between N10,000 and N100,000 under the TraderMoni and the MarketMoni Schemes, respectively, to small business owners; and putting back pensioners on the payroll. "Alhaji Atiku Abubakar has the right to do whatever is lawful to challenge the outcome of that election. But he cannot get through the back door what he couldn't get through the front door. That will be a pipe dream," the minister said.